So, I've procrastinated long enough. Today is the day. I'm doing a lot of canning, which is helping to warm up the house. 2:15: I have four quarts of tomatoes in the pressure canner right now. I have my huge stockpot filled with tomato sauce... it will probably be there for a good couple of hours. I have a saucepan going with apples for applesauce. And we have a bunch of apples stacked up for the kids to peel/slice to freeze for pies or crisps. Tomatoes: I peel them by putting them in boiling water for a couple minutes, then into ice water. Slice 'em into pretty big chunks, put them into quart jars. Meanwhile, I was heating up a combination of tomato juice and water (didn't have enough tomato juice to do it straight). Poured that over the tomatoes, put jars into the pressure canner (where the water was already heated up). Put on the lid (but not the weight). When it got to the point of steam coming out, I let it do that for 10 minutes. Then I put the weight on at 10 lbs (we're at a pretty high altitude), brought back to the point of it jiggling, adjusted it and processed 15 minutes. Tomato Sauce: I washed and cored, and threw into a big pot. Also added the leftover tomato juice/water from above. Brought that to a boil. Meanwhile, I sauted some onion and added it to the pot too. Let that whole mix simmer for an hour or so, then I put about 2/3 of it through the blender. Simmer again to let it thicken. Pour into jars, and pressure cook at 10 pounds for 20 minutes. Again, you want to adjust if you are at lower altitudes. I do NOT peel, or de-seed my tomatoes when doing sauce. 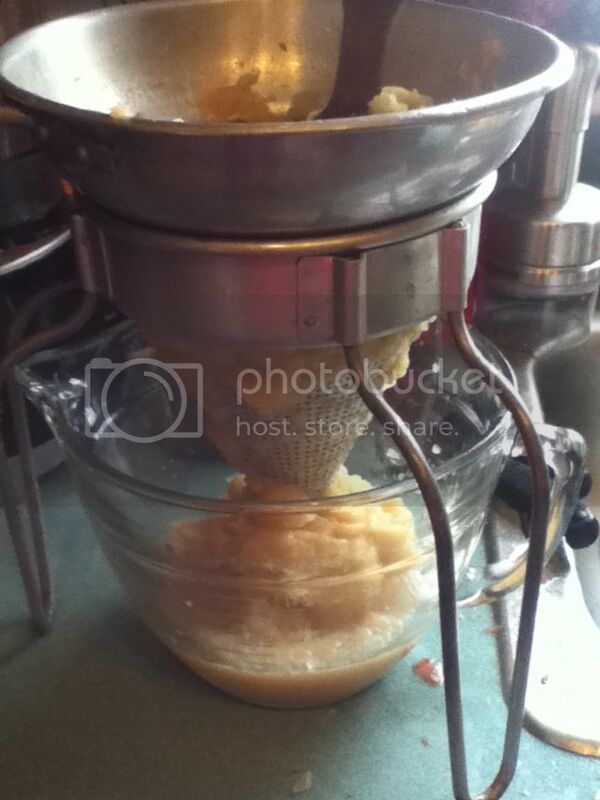 Apple Sauce: I wash and cut all bad spots out. I chop 'em into pretty big chunks, and throw it all (peels, cores, seeds) into a saucepan with a couple inches of water. 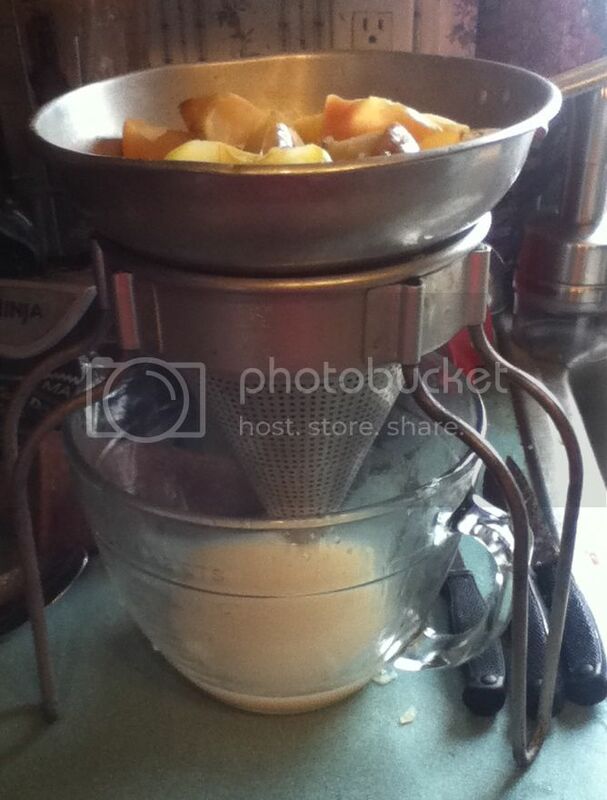 When the water boils, I turn it to a simmer, and keep stirring it up until the apples are starting to fall apart. Then I put it all into my grandma's food mill. The liquid is usually shared by my kids... basically a weak, hot apple juice. Using the mill, which is all manual labor, I get the sauce. I put the sauce back into the saucepan, and add some cinnamon, and maybe a bit of sugar. I taste it to decide on that. I simmer that until it looks like applesauce... Usually we don't do enough for me to do anything with it besides throw it into a jar or a plastic container and put it into the fridge to be used within a week or so. I may add some photos later... but I want to post this. And I better be adding a part 2 later today. would love to hear what all you can each year. You're my hero. I got a pressure cooker 2 years ago for Christmas and have yet to take it out of the box. I totally agree about the apple sauce. I never seem to have enough to last us any time at all. Oh, I really want to learn how to do this. My Dad was/is always canning stuff but I never learned how. I was always snapping the beans :). That being said, I do make applesauce in the crockpot and it is sooooo good homemade.